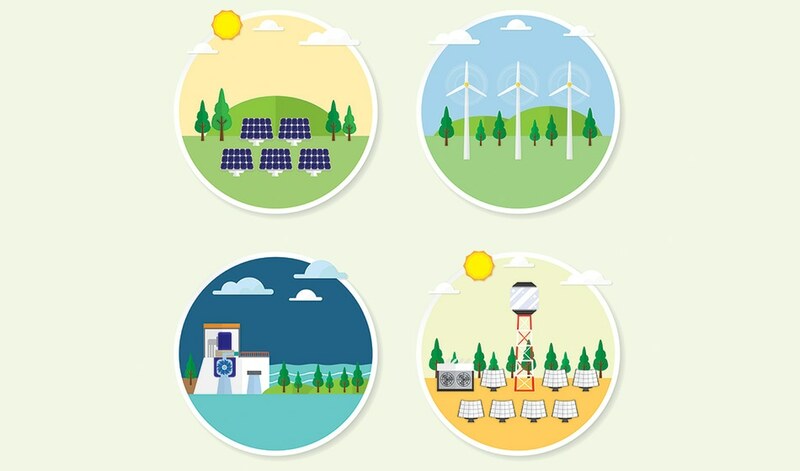 One proposed solution to the intermittency problem, and the portability problem, presented by renewable energy sources like wind and solar power has been solar fuel reactors. During peak supply hours, excess power is converted into a portable fuel, such as hydrogen, which can be produced from water using electrolysis with the photovoltaic electricity supply. Given that a lot of hydrogen is currently made by processing methane in a carbon-emission intensive way, such solar fuel reactors are a greener alternative, and Toyota’s Mirai is proof that cars can run on hydrogen fuel cells. Hydrogen electrolysis is just one example of the fuels that can be produced using solar energy to drive chemical reactions, which then store the energy for future use. But all such approaches suffer from the problem of what to do at night, or in cloudy weather. For many chemical reactions, there is a threshold temperature below which the chemical reaction ceases to occur and many thermochemical reactions occur faster at greater temperatures. Concentrating solar power (CSP), which uses arrays of mirrors or lenses to focus the sun’s rays, can produce very high temperatures – hundreds of degrees Celsius – allowing these chemical reactions to occur and store energy. Initial considerations of thermochemistry from the 1960s attempted to use nuclear reactors to attain the temperatures required, but it transpires that CSP is an easier and cheaper technique. But the intermittency of the sun’s rays introduces a lot of variability into the temperatures that CSP can achieve, and hence the reaction rate. Worse, at night, the CSP reactor can cool down entirely – wasting valuable residual heat and requiring more energy the next day to return to a good operating temperature. Justin Lapp, the paper's lead author, - now Assistant Professor of Mechanical Engineering at the University of Maine – explains. "So the main idea of CONTISOL was to build two reactors together," he said. "One where sunlight is directly doing chemical processing. The other side for storing energy. In the chemical channels the high temperatures of the material drive the chemical reaction and you get a change from reactants to products within those channels, and in the air channels cooler air goes in the front and hotter air comes out the back." The current device is a prototype. Much of the useful solar thermochemistry occurs at or above 800-900 Celsius; this is what’s required to rearrange water and hydrocarbon molecules into solar fuels. The team used simulated ‘suns’ to illuminate the device in Cologne, Germany – and simulated the storage and exchange mechanism as well as the reactor. The device operated with an output power of 5kW; good for a lab-demonstration, but the project would need to be scaled up before deployment. This scale is a scientific prototype simply for us to understand how to control it. It wouldn't be commercialized at 5 kW. Commercially, 1-5 MW would be about the smallest for industrial-scale reactors, and they could scale to 100 MW or even larger. In our case we are doing methane reforming as an example. But it's not tied to methane, it could make any number of solar fuels. One interesting one is hydrogen production from sulphuric acid as a cycling material. When you evaporate sulphuric acid at about 400 C into steam and SO3, it is not corrosive, so you can even use stainless steel components. Concentrated solar power plants often use thermal storage techniques that involve solids, rather than air as in the case of CONTISOL. Often, the technique is to concentrate some of the power onto copper or other metal alloys. The alloys melt in the intense heat; later, when the sun’s not shining, the latent heat stored in the melted alloys is released as they reform, smoothing out the diurnal cycle of heat in the device. CONTISOL, however, prefers air for a number of reasons: it’s abundant and freely available, and its chemical structure doesn’t change at high temperatures. "It can pull air in just out of the atmosphere and then runs it through the heat exchanger to store the heat. And then it can vent that air out once it is cool,” notes Lapp. If you try the traditional solids-based approach, "you have to ensure the system is sealed everywhere and if you lose some you must buy more to make it up. With air you don't have that problem." Having reached the operating temperature, the team see two areas for potential future research. First, they need to change the material in their air receiver. Having previously used silicon carbide, they now hope to deploy a harder metal alloy called Inconel; this should improve the leakage rate of air and the response time of the receiver. The next stage would be to scale up the solar fuel reactor into a commercial size. You can read the paper, released open-access, here. SolarPACES (Solar Power And Chemical Energy Systems) is an international collaboration among researchers advancing solar thermal energy, which encompasses flexible and dispatchable solar power generation, thermal energy storage, industrial applications and thermochemical solar fuels.